Aaron Sanchez held the Red Sox to one run in seven innings and Jose Bautista homered to lift the Blue Jays to a 5-3 win Sunday at Fenway Park. Bautista launched one over the Green Monster in the first inning off knuckleballer Steven Wright, and the next three batters smacked singles to give Toronto an early 2-0 lead. The Blue Jays tacked on two more runs in the seventh and another in the ninth against Boston's bullpen. "For the most part we stuck to the game plan early in the game," Sanchez said. "It's nice to go out there with two runs on the board, not really feeling like I have to be too fine, just kind of fill up the strike zone and work on the things I need to work on." In the bottom of the ninth, Travis Shaw cut a four-run deficit in half with a two-run homer off Blue Jays closer Roberto Osuna. But Osuna retired the next three batters to seal the win. The 23-year-old Sanchez relied heavily on his high-90s fastball to strike out seven and allowed just two hits as he lowered his ERA to 1.35. The Red Sox had a season-low four hits on the afternoon, while the Blue Jays had a season-high 14. "I think I gave all the answers to all the questions before they asked them," Colabello said. "As soon as they got out there I said, 'I'm good.' And they're like, 'You should stay down.' And I'm like, 'No, I know I'm just taking my shin guard off.' I said, 'I'm at Fenway Park. We're in Boston. It's Sunday. It's the day before Marathon Monday. It's my hometown.'" "It feels great, man," Hernandez said. "I just go out there and try to go hard and, at the same time, have fun." Bautista's blast: Bautista entered the game hitless in four at-bats against Wright, with a walk and two strikeouts. He got to Wright in his first plate appearance Sunday, blasting a two-out solo home run in the first inning. It was the first of four consecutive hits against Wright in the Blue Jays' two-run inning. Bautista has more home runs (18) than any other visiting player at Fenway since 2010. He has a .975 OPS in Boston for his career. "I enjoy it a lot," Bautista said of hitting at Fenway. "It's a stadium that's basically tailor-made for my swing. So it works." Wright the ship: Wright got off to a shaky start in the first inning but did not allow another run through the rest of his six-inning start. He has given up just three earned runs in 12 2/3 innings this season with 11 strikeouts and three walks. Dating back to last year, Wright has held opponents to two earned runs or fewer in six straight outings. "Outstanding job," Red Sox manager John Farrell said of Wright. "He threw a lot of strikes, he was able to change speeds effectively, and against that lineup that is -- as we know -- very powerful, he was able to slow them down for six innings and clearly keep us in the ballgame." With two outs in the top of the seventh, Toronto took a 4-1 lead on an RBI single by Edwin Encarnacion, who advanced to second base on the throw home. The Red Sox challenged the call at second base, and after review, it was ruled that the call stands. 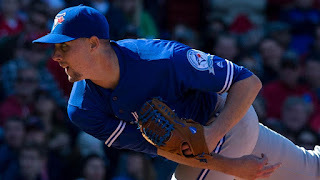 Blue Jays: J.A. Happ heads to the mound as Toronto wraps up its four-game series against the Red Sox on Monday at 11:05 a.m. ET. Happ has posted quality starts in both his outings this season, and he picked up a win in his last start, throwing six innings of one-run ball against the Yankees. Red Sox: The Sox go for the series victory against the Jays on Patriots' Day in Boston. Clay Buchholz takes the mound looking to recover from a rocky first two starts in which he's allowed 10 earned runs in nine innings. The right-hander will need to be especially careful with Russell Martin, who has four home runs against him.